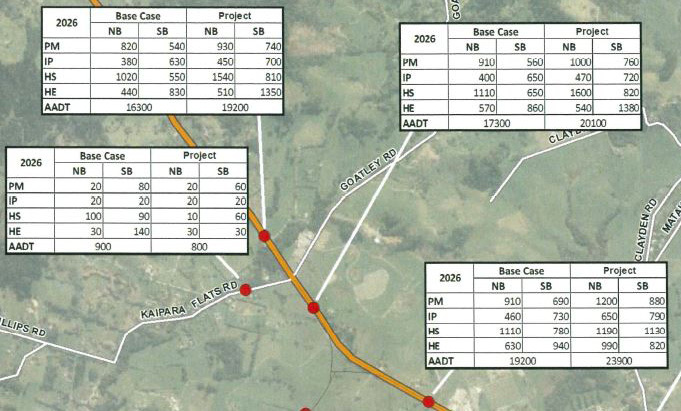 In this post we take a closer look at the Transportation and Traffic Assessment Report which the NZTA have supplied in support of their application for a $760m toll road from Puhoi to north Warkworth. 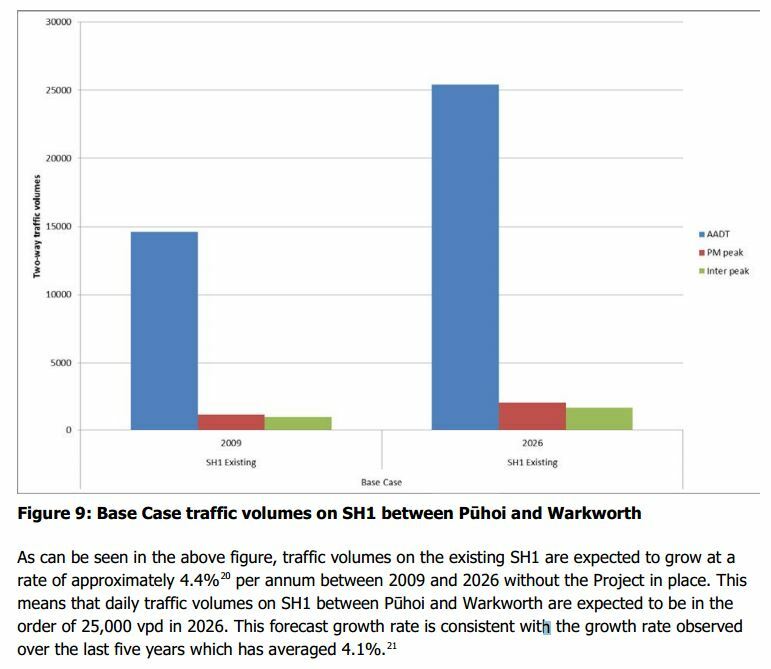 In particular, we will examine the forecast traffic growth and volumes “further north”. Footnote 21 says the 4.1% figure is based on NZTA’s TMS count site south of McKinney Road, which is just south of central Warkworth. Looking at the data from the NZTA State Highway Traffic Volumes, a growth rate of 4% does indeed appear to be not a bad fit. The figures quoted are two way traffic counts. However, the report does not explain why this particular count site has been chosen. Traffic counts at McKinney Road will reflect the growth of trips in and around Warkworth itself – trips that aren’t necessarily travelling long distances at all. It would therefore make more sense to consider the number of vehicles that currently travel the whole distance from Puhoi to Wellsford and beyond every day, and vice versa – what I will refer to as “further north” trips. 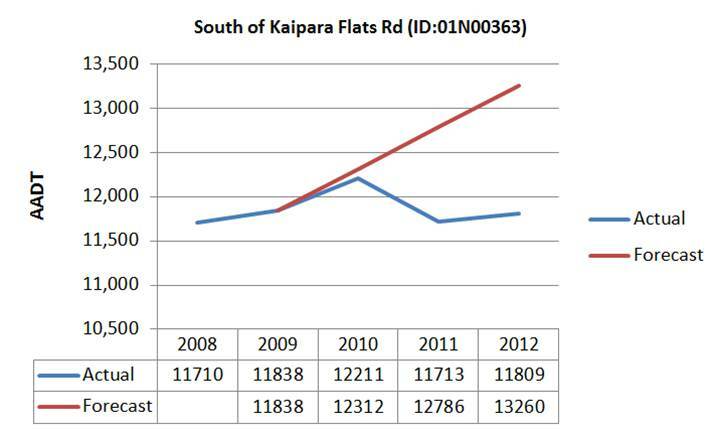 We can get an idea of the trend in this traffic by looking at Kaipara Flats road, which is just north of the northern junction of the project. As you can see, this chart tells a very different story – no long term growth whatsoever for the period 2008 to 2012. Other traffic counters like the one at Waipu show a similar “flatline” trend. But at this point we still don’t know what proportion of these trips are “further north”. I asked NZTA if they had modelled “further north” trips and it turns out they had, but hadn’t included it in the report. The 2009 Base Case model comes out at just 4,460 trips a day. The 2026 Project model, 5 years after the project is complete, has 5,930 trips travelling to or from “further north”. This seems like an astonishingly small number of trips for which to build a four lane toll road. NZTA claim that a number of toll road users will have origins or destinations in Warkworth and Matakana, despite the fact that it will be quicker to use the existing SH1. Go figure. Apparently NZTA are no longer sure what the split in traffic will be. Without this, trying to get a handle on expected traffic flows becomes hard. If we know only 5,930 trips are travelling to / from “further north”, then this represents only 31% of the traffic north of Kaipara Flats (19,200). Where are all the other vehicles coming from, and what impact will the proposed toll road have on their travel times? I’m hoping NZTA will be providing the revised split of traffic or, ideally, the whole report will be subject to an independent review. Thanks to mfwic in the comments below, we have an extended series of data for McKinney Rd. 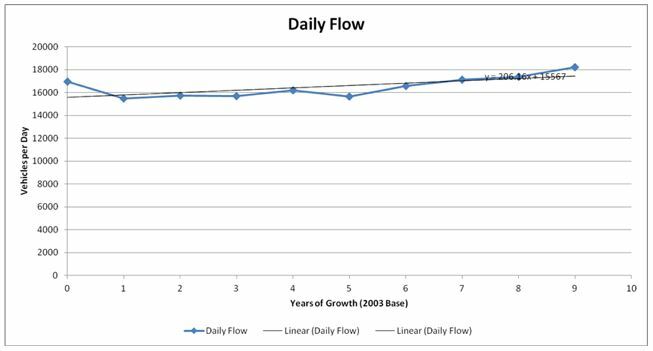 With a base line of 2003, linear growth of just 2.1% is observed. Which makes NZTA’s modelling look even more overstated. So just like the Basin Reserve project it seems that NZTA are cooking the books to serve their political masters. Are there any NZTA projections that have come true? I might pool the estimates and run a regression on their numbers, and measure their accuracy. As you don,t agree with the motorway North of Puhoi you would say that wouldn,t you. One could pull the figures to bits on the rail loop as well. Go on Dennis, pull the CRL figures to bits. I dare ya! Dennis; go ahead, show us the figures, otherwise that is just an empty accusation. No?, Ok I’ll do it for you: rail ridership in Auckland has grown an average 18% pa this century. Here NZTA is lying in order to try to get to 4%… Really? Anyway these are well paid public servants and frankly this kind of craven and unprofessional massaging of data is really shameful. Careers may be tainted by this behaviour. 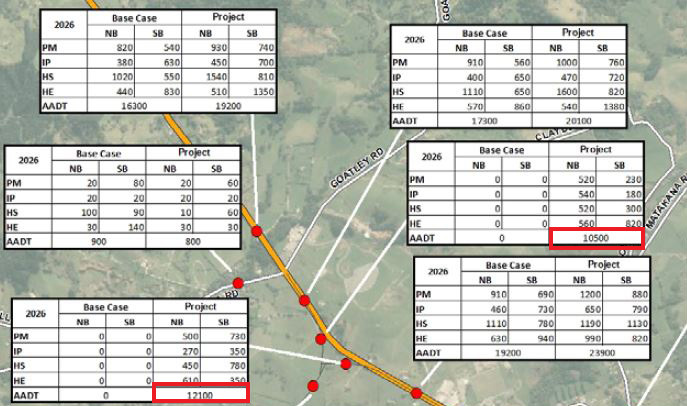 CRL has been subjected to 50x the analysis of this project. It gets stronger with each further analysis. The flaws with NZTA’s justification of this project are massive. For example ignoring the toll when forecasting traffic is like projecting CRL patronage if trains were free. Which has NOT happened in CRL analysis. Hi Dennis – CBT is politically independent and is funded by members. I believe the arguments put forward in this post (and subsequent ones) are rational and evidence based. You ever read the “about” section? Dennis what’s your argument – ‘keep politics out of tax payer funded transport investment issues’ !? What could be more political than discussing how our taxes are spent? Of course it’s political- but we are not members of any political parties, and we do engage with MPs form all parties whenever possible, especial the government, with whom we have formal meetings. Nor are we funded by anyone. At all. Also I think you’ll find that Parties are more in the habit of taking money than handing it around! Actually we tend to see it as increasing transport choices to give people realistic freedom to decide the best way to travel, and deregulating controls on private property, that’s a very liberal conservative stance. Having the government tax us all heavily and the spend it on only one mode of infrastructure, coupled with an enormous array of planning controls that stop you doing what you want with your own land, well that’s socialist. We advocate against that status quo. The blog is funded by an annual movie night fundraiser and reader donations to cover the hosting costs. The real ‘funding’ is all the unpaid time Matt and others spend writing posts, going to meetings and reading reports and proposals. Do remember that people using the old road will benefit from the project as well as the split will surely be such that both routes are uncongested, even with a $2 toll which is insignificant to many. Plus I do think most people heading out Matakana way will opt to use the toll road even if it isn’t much faster. A link to Matakana Rd is looking likely too, so it should be a bit faster and certainly more consistent time-wise. But without the Matakana link road everyone heading to the beaches will still have to go through the nasty Hill St intersection. Jon, this is our blog. Comments are allowed at our discretion. As long as people are civil in their comments, we will almost always leave them alone, and this may approximate free speech to the casual observer, but it’s not the same as free speech. Just like you couldn’t go onto McDonald’s Facebook page and rant about how the beef patties are made from moon rocks and expect it to not be deleted. It’s just Phil using yet another fake name and fake email address. i am not Phil, do you only think that there is one person who might not agree with this blog. Same IP address as six other fake names and fake email address each only used once to moan about the blog after posting as Phil. You were banned for precisely this reason, deal with it. I believe this blog raises a lot of good points and being politically aligned is not a crime. It is not essential to know but would be nice. We are just a bunch of individuals from quite different backgrounds and do in fact have different political leanings, and while we do generally agree on issues around our core interest of Transport and Urban Form we also have differing views there too. Discussions can get interesting. We are not politically aligned and will be as tough on any government that does dopey stuff- and you can be sure the next one will whatever its stripes. Can’t work out the tables. Is the thick yellow line on the map the holiday highway going all the way to Wellsford? Is it a north up map? What is the base case? It consistently shows a lower number. What do PM, IP, HS and HE mean? how are the numbers in the cloumns manipulated to get the AADT? Ok I take your word for it that you are self funded and not politically aligned. Unfortunately I cannot always follow this site so you may have already answered this. The state and design of the road is almost third world status. Given that the Unitary plan calls for 22000 new homes in the Warkworth area and that we have a good motorway that stops at the tunnels. Why?.. What would you suggest for the future. I realise that you want the roading funds for public transport but we have a problem that needs solving. Under “our proposals” above click “operation lifesaver”, that’s the proposal for the future. Effectively it’s an ongoing upgrade of the existing highway that is cheaper and faster to deliver, combined with two key bypasses and a couple of link roads. If this massive project had not come along then that road would already be being upgraded. And remember even once PuFord is finished the current road will still be there and be being used. Used by locals, and by anyone not wishing to pay a toll. The current road is dangerous, it kills its users more than the average State Highway. Our view is that Warkworth urgently needs a bypass and the dangerous sections of the current SH urgently need upgrading. And will still need these whatever else happens on some new road. In fact with less traffic the old road will encourage faster speeds and will probably kill more of its users. If Puford happens then the old road will no longer be a SH and will not be funded by NZTA but rather become the responsibility of AT…. good luck then with getting this ‘third world’ and murderous road fixed. Both of these things were planned but have been pulled because of course doing them would completely solve the problem and remove even the slightest justification for the massive and destructive motorway. Dennis, the new toll road won’t directly benefit the growth areas of Warkworth. The fastest route will be the existing SH1. Yes, there will be less traffic thanks to the toll road, but forecast traffic volumes and crash rates will be about the same as today. OK guys good suggestions. Next question, why is NZTA then focusing on building a motorway sometime in the future rather than implementing the improvements you have suggested. Do they want the funds for Transmission Gully? The proposal based on Operation Lifesaver will be half a billion dollars cheaper than the toll road. The only reason the toll road is progressing is that it has been mandated by the Minister of Transport. There is no logic to it. In fact it’s the opposite of logic. The RoNS include a stack of fanciful motorway projects that can’t pass the criteria for funding under the regular process. The government had to invent a new process to fund these routes which are by definition economically unsound. What’s particularly sad is that even the name is lazily derivative of outdated thinking… the ‘Roads of National Significance’ banner was used by the Howard government in Australia because they wanted people to know that their pork-barrelling came from the Federal Government and not the various states (which for most of the Howard government’s time were Labor). In NZ, without the federal-state split context, even the name of this programme looks pathetic. Both these projects are political choices not NZTA’s. That’s what the RoNS system is; a device to fastrack projects chosen by the government regardless of their value under normal processes. Because they just like them and because clearly believe it is good electorally for them- which explains why they are spread around the country regardless of need. Traffic is not just flat around Wellington, for example- it’s falling. The RoNS were also explained as urgent economic stimulus during the gov’s first term because of the recession. An odd bit of anti-austerity that goes against the flow of the general ‘belt-tightening’ idea. If it was made clear to voters that this road does not make it quicker to Warkworth (except for perhaps taking some traffic off the existing road) then it might end up bad electorally for them. I wonder if the other parties are capable of getting this across to enough voters before the election? I wonder how the rest of NZ would feel if they knew they were paying for an Auckland road that was completely unnecessary? They hate us enough when they pay for projects that are necessary! Patrick is spot on that the RoNS are vote buyers, (Peter Dunn’s in particular).But to be politically neutral, Labour began this practice with the Land Transport Management Act in 2004 in which a schedule allocated the Government’s share of the petrol tax to the key electorates of Dunn and Peters and to Auckland (which is critical to Labour’s party vote). The then mayor of Christchurch didn’t kick up a fuss about the five year delay to the restart of construction of the Southern Motorway and was appointed to the board of NZTA when he lost the mayoralty, which of course is not illegal nor considered as corruption in this country. You will notice that most of regions without RoNs (or very cheap RoNS per capita), are getting funding for irrigation schemes instead of motorways. The RoNS appraoch of progressively building superhighways outwards from select cities at the expense of continuously improving all highways is the same approach taken by the original Main Highways Board between 1924 and 1954 which resulted in in massive improvements to the urban ‘gateways’ to each city or major borough and minimal improvement to the highways between major population centres or to the all important (at the time) farm access roads. Between 1954 and 1974 the new National Roads Board took the exact opposite approach, using cheap chip seal to get maximum miles of roads classified as dustless or all weather and with most weight restricted bridges replaced with new ones, albeit often only one lane on rural roads. The aim was maximum improvement in transport efficiency in the shortest possible time at a cost affordable to the motoring population of the time. The RoNS are not only bad investments in themselves, they are also starving the roads and highways built in that 1954-1974 period of the maintenance funding that is now becoming critical to preserve that earlier investment. I may be wrong but it seems National is no longer “the farmers party” and is now the property developers party. I have been using the McKinney site and got 1.3% growth over 10 years. I cant upload my graph but I got 2003,16940	2004,15470	2005,15726	2006,15670	2007,16188	2008,15659	2009,16571	2010,17136	2011,17384	2012,18206. From that I got a slope of 206.16 and an Y intercept of 15567 with a growth rate of slope/yintcept of 1.3% straight line. I guess it shows that the start point is important for estimating growth. Always! Where is the count taken? 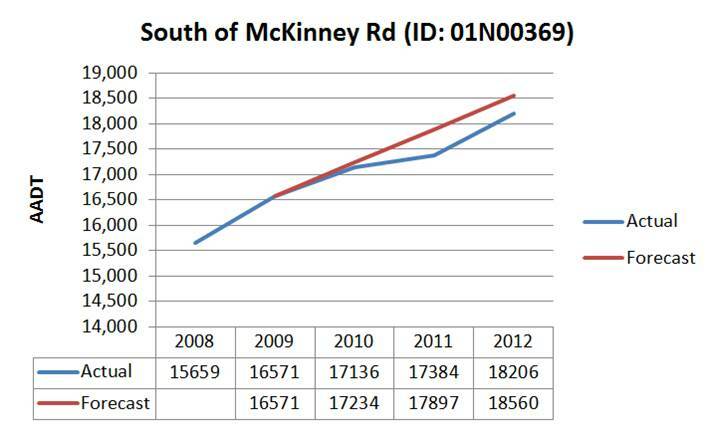 The data I posted is SH1 south of McKinney and it is annual averages. I have 2000, 13330	2001, 14990	2002,13630 if you want to extend the plot further. Thanks very much for this – I’ve updated the post with the chart. More crazy nonsense from our spineless government bureaucrats. We may not be a corrupt country, but we certainly are incompetent. I can’t believe that the media arent picking this stuff up, especially in an election year. This is gross financial mismanagement on a massive scale. Imagine if MoE or MoH or MSD spent half a billion more than needed on some gold plated School/Hospital/Welfare program because of some very dodgy use of statistics. I may be right-wing, but I just can’t support a government that twists/denies the facts so badly. I may as well just make a protest vote to the Internet Party. Yes the national party believe in free markets and privatisation and cost benefit analysis, but only when it suits them. They have no problems with stopping people doing what they want with their land, building roads that make no sense, subsidising electricity to an overseas aluminium manufacturer, and forcing us to pay more to an overseas monopoly for our phone line than people in other countries do. Not saying Labour are any better, I don’t think any NZ party get close to my ideals. PuFord is really becoming the current Governments “Think Big” projects. But unlike building power stations or electrified railway lines, all we will get is an over priced, under used four lane highway. Not good for NZ Inc at all. Thank god we have a chance to drop this Govt on Sept 20th! The national party will not get any votes for delaying the Puhoi Warkworth motorway till 2019 or later. There must be other reasons. Additionally there is not enough votes for national in North Rodney to worry them as evidenced by them including North Rodney in the Auckland Council against the wishes of a large number of ratepayers. I don’t believe that the National Party are delaying the Puhoi to Warkworth motorway deliberately. In fact they are doing their best to steamroller the whole thing by “fast-tracking” it through the process, including the EPA hearing which is happening right now. NZTA stated on the opening day of the hearing that they want a start date of 2016, so with a 5 year build programme, that means completion by 2021. If this government hadn’t been so dogmatic about the RoNS, then an Operation Lifesaver type scheme would have been in place by 2016 at 20% of the cost and solving most of the problem, including saving many lives that will inevitably be lost on this dangerous road between now and 2021. The regrettable thing is that the elected representatives for Rodney (MP Mark Mitchell – National, Councillor Penny Webster and Local board members) have all been sitting on their hands because they believe that this motorway will cure all ills, whilst all unbiased, non-political “students” of transport matters can see that it will in fact cause even more problems. Already it is obvious that work has been delayed on fixing the Hill St. junction (a major bone of contention for residents of Warkworth, Snells Beach, Algies Bay, Matakana, Omaha etc. and for those trying to head N through the junction on SH1.) because funds have been diverted to the P2W motorway. Once the Mway is complete, the existing highway will revert to the care of Auckland Council and they certainly will not have the funds to maintain or carry out safety improvements on the required scale. Tommy Parker from NZTA was understandably, not prepared to commit to this work after the handover at a recent facilitated meeting in Warkworth. The Matakana link road is no answer, whether it is built before or after the Mway. 70% of all the traffic travelling through Hill St and heading East, is not destined for Matakana Road, but rather wants to travel along Sandspit Road and this traffic has to defer to the minority usage road. My view and that of many others, is that if this junction were remodelled and the bottleneck at the Shoesmith bridge were resolved, then together with the additional safety improvements to SH1 detailed in Operation Lifesaver, this would largely negate the need for the Motorway. However NZTA are terrified of the negative reaction there would be to 2 seasons of disruption on the highway. Fair comment Bob. Perhaps the Western Collector could be built sooner and used as a diversion so Hill St can be reconstructed? As someone pointed out the other day, when genuine consultation takes place you generally get a far better solution in the end. Mitigation through the BOI process is not a good substitute for that. Bob I think you are being generous. Parker cannot possibly allow Hill Rd and the worst parts of the existing road to be fixed as that would completely destroy any case for the vast overkill project he is charged with delivering. His line about disruption is merely a fig leaf for that deeper reason. Disruption can also be sold as ‘jam tomorrow’ as NZTA do all the time, and the people of Warkworth would stoically accept as they are suffering with current bottleneck ,as you know only too well. Simple, affordable, being rolled out in stages, and will assist a dangerous piece of highway that I believe carries more private and freight traffic on average than that particular piece of SH1 does and ever will. Can’t agree more Ben (although as a frequent user of SH2 south of the Bombays I am a little biased). Nice to see that the NZTA is also looking at safety improvements for the Western and Eastern sections i.e. the bits not targeted for bypassing… after the usual several years’ delay we should hopefully have a much safer SH2. Your feeling is no secret – the NZTA say on their website that due to the Waikato expressway being fast tracked they have given SH2 less priority. However, traffic volumes for cars will stay high, so safety is still an issue. Freight and longer distance (Tauranga/Rotorua and south) traffic will decline though. Unfortunately the RoNS are sucking much needed funds away from more vital projects such as the CRL. But are there alternative sources of funding e.g. Salvador in Brazil obtained funding from the World Bank for its construction of a metro. Why don’t we send Len to argue for funding that is necessary because the government can’t afford it. He could always point to our figures on child poverty to support his contention that money is tight. Such an approach would be an ultimate kick in the guts for John Key and would be the end of any political goodwill towards Len, but let’s face it, he is dead in the water anyway. Or Len could take a leaf out of Gina Rinehart’s book where she funded the unfundable Roys Hill project by going to the Americans. Do Caterpillar make trains? That’s not a bad idea, would make Key look like an absolute twit as well is the World Bank thinks we are so impoverished that they pay out for development. Presumably the World Bank funding was in the form of a loan, and the World Bank made the loan because no-one else would touch them with a barge pole. In which case, borrowing the money to fund the rail tunnel is already an option for Auckland and a common way of financing capital projects. We’re still waiting to find out how Brown intends to fund Auckland’s half of the tunnel. I’m not sure why Brown opting to borrow the money should make Key look like an “absolute twit” or be an “ultimate kick in the guts” for him. It’d just mean that Brown had stopped prevaricating and finally made a decision. Not trains but locomotives. Caterpillar bought EMD (Electro-motive diesel, once part of GM) a few years back. As a frequent user of the ridiculous Hill St intersection the PuFord toll road really winds me up.